FREE CampaignSaver® Data Quality Analysis from Interact Direct Marketing Inc.
"We significantly boosted our response rate and saved thousands of dollars in production costs by using Interact Direct's CampaignSaver® service to check the accuracy of our customer list before it mailed." Analysis of your entire mailing list in just 24 hours! Interact Direct is Canada's leading provider of contact data quality and enhancement services. We help marketers and corporate database managers across the U.S. and Canada improve and maintain tens of millions of contact records. In fact, we've helped hundreds of companies execute successful direct marketing campaigns by helping them improve the quality of their customer list before every campaign. Whether you're a small business, a multi-national corporation, or you're somewhere in between, you too can benefit from our data quality solutions. What Does Your FREE CampaignSaver® report include? Demographic Profile of Your Customers — Your CampaignSaver® report begins with a complete demographic profile of your target audience. You'll be able to better target your communications by finding out the age, income, education level and much more about the contacts on your list. Customers who moved without you knowing — Approximately six million Canadians move every year. CampaignSaver® shows you how many of these reported movers are your customers, by comparing your customer list to Canada Post's National Change of Address database, for the past three years. Invalid Addresses — Your customer list is compared to Canada Post's master address database so you know how many addresses are invalid and how many can be easily corrected. Correctable Addresses — A percentage of your current invalid addresses can be easily fixed with a simple data update. The CampaignSaver® analysis shows you how many. Duplicate Identification — With several thousand names on your customer list, you're likely to have hundreds of duplicate entries that drive your costs up and irritate your customers. CampaignSaver® identifies the number of duplicate entries for both individuals and households on your list so you can decide which ones to remove. PLUS — Canadian Telephone Number Append CampaignSaver® shows you how many Canadian telephone numbers can be added to your list, based on cross-referencing with a high-quality Canadian master file of home telephone numbers. 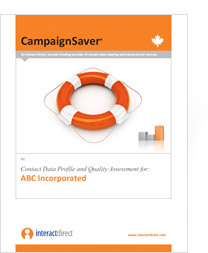 Questions about CampaignSaver® Data Quality Analysis? Call us today at 1-866-925-2849.